The term 'Popular Music' has traditionally denoted different things in France and Britain. In France, the very concept of 'popular' music has been fiercely debated and contested, whereas in Britain and more largely throughout what the French describe as the 'Anglo-saxon' world 'popular music' has been more readily accepted as a description of what people do as leisure or consume as part of the music industry, and as something that academics are legitimately entitled to study. French researchers have for some decades been keenly interested in reading British and American studies of popular culture and popular music and have often imported key concepts and methodologies into their own work on French music, but apart from the widespread use of elements of 'French theory' in British and American research, the 'Anglo-saxon' world has remained largely ignorant of particular traditions of the study of popular music in France and specific theoretical debates or organizational principles of the making and consuming of French musics. 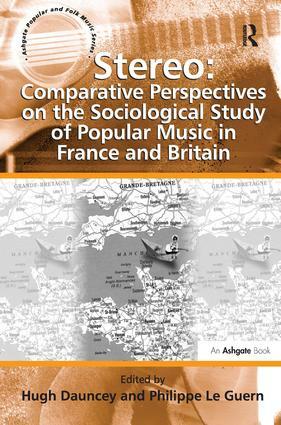 French, British and American research into popular music has thus coexisted - with considerable cross-fertilization - for many years, but the barriers of language and different academic traditions have made it hard for French and anglophone researchers to fully appreciate the ways in which popular music has developed in their respective countries and the perspectives on its study adopted by their colleagues. This volume provides a comparative and contrastive perspective on popular music and its study in France and the UK. Hugh Dauncey is Senior Lecturer in French Studies at Newcastle University, UK and associate member of the CNRS/Paris 1 Sorbonne University Georges Friedmann research laboratory. He teaches and researches French and francophone popular culture - particularly music and sport - and has edited a number of studies, such as (with S. Cannon) Popular Music in France from Chanson to Techno: Culture, Identity, Society (Ashgate, 2003), (with G. Hare) The Tour de France, 1903-2003: A Century of Sporting Structures, Meanings and Values (2003) and French Popular Culture (2003). He is currently working on a monograph study of cycling in France as leisure and sport and various studies of French sporting and musical culture. In 2003 he was decorated by the French state with the order of the Palmes Académiques, in recognition of 'services to French Culture'. Philippe Le Guern is Professor of Sociology of Culture at the University of Avignon, member of the Centre Norbert Elias research laboratory (CNRS-EHESS-UAPV), France, and associate member of the Georges Friedmann research laboratory (Paris 1-CNRS). He has edited a number of studies on popular culture including Les cultes médiatiques. Oeuvres cultes et culture fan (2002) and (with J. Migozzi) Production(s) du Populaire (2004). He has worked to encourage dialogue between French and British researchers studying popular music through ventures such as the special number (Vol. 25, 141-42, 2007) of the French journal Réseaux (co-edited with S. Frith) available on-line at http://reseaux.revuesonline.com, and the recent creation of the webjournal Cultures sonores (www.culturessonores.org). Current work covers music and everyday life, the impact of digital technologies on work practices in the music and film industries and trends towards considering popular music as 'heritage'. He is principal investigator in a French national research council project on the effects of digital technologies on work in cultural industries.